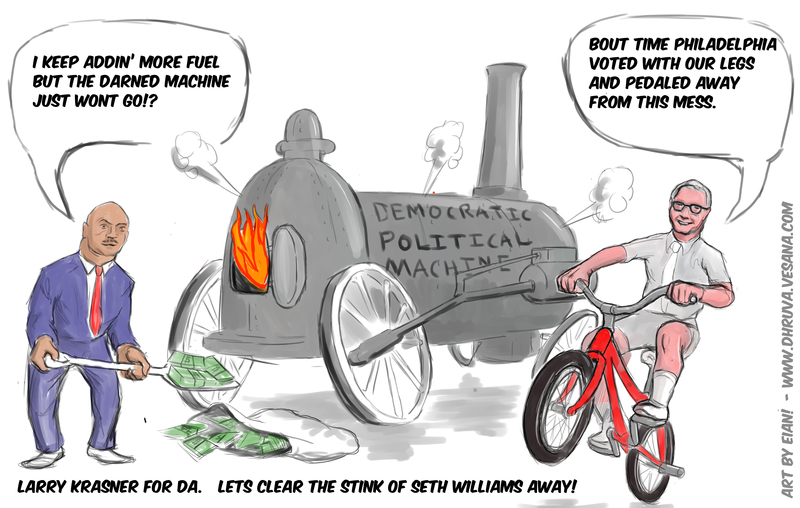 Image caption: An illustrated comic of Seth Williams shoveling money into a machine labeled “Democratic Political Machine,” “I KEEP ADDIN’ MORE FUEL BUT THE DARNED MACHINE JUST WON’T GO? !”, next to Krasner on a bike, saying “‘BOUT TIME PHILADELPHIA VOTED WITH OUR LEGS AND PEDALED AWAY FROM THIS MESS” with text below reading “LARRY KRASNER FOR DA, LET’S CLEAR THE SINK OF SETH WILLIAMS AWAY”. When a close friend of mine told me that a family member of his on the outside told him over the phone that Larry Krasner included Ron Castille in his Transition Team, I didn’t believe it. Then my friend said that, in fact, the report said Castille was Krasner’s first pick. I questioned the accuracy of the report he got from his family, i.e., his son, so hard that he started to question whether his son had read the report correctly. I mean, he started to doubt his own son and whether he himself heard his son right. That’s how hard I was defending Krasner. In my mind, there was no way someone who ran on an unprecedented, unapologetic, uncompromising “End Mass Incarceration” platform would seek and rely on one of the “purveyors of mass incarceration” to advise him on how to transition to what he promised, and what we hoped, would be a new culture in Philadelphia’s DA’s office. With respect to the rationale about “a symbolic transition team,” what does/would such a team with Ron Castille on it symbolize? What do We want, and what would We have, the transition team for Philly’s new DA symbolize or be “symbolic” of? What does Ron Castille symbolize? Is he a good symbol? One main campaign promise of Krasner’s was to change the culture of the DA’s office. Ron Castille does not represent/symbolize Change. Contrarily, he was one of the purveyors of the culture that Krasner promised to change and that the people elected him to change. Castille was DA of Philadelphia from 1986-1990. He was the DA when his ADA Jack McMahon made the training video for and in front of young rookie prosecutors, schooling them on tactics for using peremptory strikes to exclude people of color from the jury in order to racially stack a jury prone to convict a defendant of color. That videotape was included in Castille’s office library for rookie prosecutors to check out and use as a training tool. Castille was Chief Justice of the PA Supreme Court that ruled Miller v. Alabama/Jackson v. Hobbs “not retroactive” to JDBI [juvenile death by incarceration/life without parole] cases on collateral review. Castille wrote the opinion — Commonwealth v. Cunningham. He wanted to maintain DBI sentences for condemned children such as me who raised their JDBI issue on collateral. If Krasner includes Castille on the transition team, then he might as well include Lynne Abraham, too; and also Seth Williams, if he wasn’t in prison right now. Krasner’s election into the DA’s office should show that the people who put him there have won that particular institutional contest. But winning the symbolic contest is indispensable to an absolute victory in the institutional contest. Not only does the inclusion of a “symbol” such as Ron Castille in the “symbolic transition team” send mixed messages and confuse the people, but it symbolizes that we have not truly won the symbolic contest. That is, we have not won control of the narrative, the reshaping of the culture, and the meaning of all this. Even before Krasner’s victory in the primaries, just the fact that he had become a viable candidate in Rizzo-Castille-Abraham-Williams’ “Tough-On-Crime, Mass Incarcerating, DBI-Sentencing, Philadelphia,” against FOP [Fraternal Order of Police]-backed candidates, all without the full support of Democratic Party Machine, evinced that all those things were in a crisis of legitimacy. The times and the people helped to create that crisis. Krasner’s victory in the primaries affirmed, and his ultimate election to the office consolidated, the crisis of legitimacy for Tough-On-Crime policies, mass incarceration, DBI & JDBI, and the FOP. Including Ron Castille in the DA’s transition team sends a mixed message, a message of ambivalence, about where we are, where we’re going, and where we WANT to go. Even a “symbolic” transition team should symbolize a transition from the old culture to the new culture; from the city’s era of mass incarceration to the new era of MASS INCARCERATION NO MORE!!! Ron Castille was gone. As DA and as Chief Justice, he wreaked irreparable damage on Philadelphia communities that will ripple for generations. Then he hit the age of 70, where he could no longer be allowed to preside on the bench as justice, but could remain only as a senior member. He fought to maintain the position of chief justice in spite of his knowledge of the rules. The U.S. Supreme Court ordered him to recuse himself in the case of Terrell Williams (a death penalty case), and that did it. It took the highest court in the land to get him to stand down. So, he was gone; finally out of the people’s hair. Why summon him back; conjure him back up again; even symbolically? Whatever rock he was ordered to retire under, why not leave him there? Why breathe new life into him? Why give him and what he symbolizes new legitimacy? Indeed, Krasner should have felt more accountable to the communities and movements that helped him to an unprecedented and unlikely victory. This is why co-governance is so crucial. Pam Africa’s move [to protest Castille’s appointment] was the right one, and it should/must be followed-up on.